This appears in the current issue of The Brenau Window, the university’s alumni magazine. Karen Peck seems incapable of projecting the cool indifference that many celebrities affect on a red carpet. Instead, she waves giddily to the fans who are shouting her name along the roped-off pathway winding through Dollywood for the annual Southern Gospel Music Awards. Peck, looking belle-of-the-ball in a rustling black gown, would pause to hug each of them, like long-lost kin, if there were time. The gospel singer, who studied music at Brenau for two years in the 1980s, is both a presenter for this awards ceremony and a nominee for “Favorite Soprano,” an award she has won 11 times. 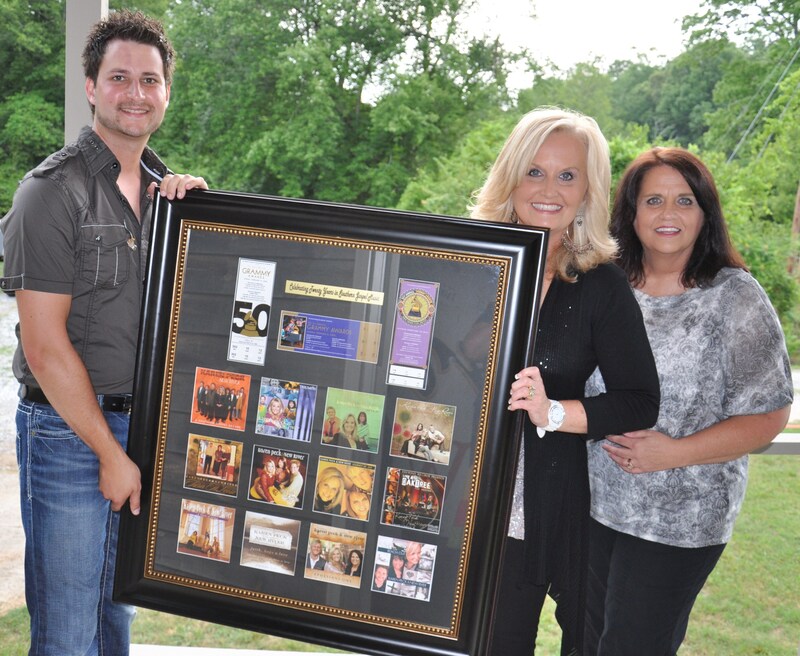 Karen Peck and New River have become a mainstay act of the “Gaither Homecoming Series” with five consecutive No. 1 songs and a “Song of the Decade” to its credits. She walks past the Southern Gospel Music Hall of Fame, with its old-fashioned, hardwood church pews, yellowed sheet music, and other homey artifacts that date to the genre’s origins a century ago as men’s “quartet music.” While women have made jubilant inroads in the industry, Peck, 51, is one of just a few who front a band with her marquee name, and she is winding up her second term as the first female president of the Southern Gospel Music Association. She does a last-minute mirror check in the “Hen House,” as the women’s dressing room in Dollywood is labeled (the vending room across the hall is the “Biscuit Basket”) with her longtime friend, Sheri Easter, a “Favorite Alto” nominee who earned her MBA through Brenau’s online program in 2006. “But this is the mackdaddy event for our form of music!” Peck says. She playfully swats him with her evening bag. Peck will appear, alongside Dolly Parton, Queen Latifah, and Kris Kristofferson, in “Joyful Noise,” a movie about a struggling, small-town gospel choir in Georgia scheduled for release in January. The film’s much-anticipated soundtrack, produced by five-time Grammy winner Mervyn Warren, includes a song, “Mighty High,” performed by Peck, who plays the master of ceremonies for a sing-off. “I think it’s great that a big, mainstream movie is celebrating Southern Gospel and including a track from an artist who has worked so hard and brought so much to the industry for years,” Couch says. The movie’s casting agency had scoured contemporary Southern Gospel music for an authentic, telegenic artist and settled on Peck, who did not have to audition. She has been playing that role since she was four. When Peck was growing up in Gainesville, Georgia, her parents would take their three daughters to the marathon, all-night gospel “sings” at the Atlanta Civic Center. Standing on tiptoe in her chair to see the performers, Peck was enraptured, in every sense of that word, with the piano chords, the homespun pageantry, and the solace of old-time religion on tear-streaked faces. When the anointing came, as they say, on Vestal Goodman, the “queen of Southern Gospel” would start waving her trademark handkerchief over her bouffant in divine semaphore. She formed a girl group called The Joyful Trio and studied classical piano for 11 years, the last eight under Brenau faculty member and cosmopolitan taskmaster, Eliza Feldmann, WC’29, who became her mentor. Feldmann, discerning potential in her pupil, helped Peck secure partial music scholarships in 1980 to attend Brenau. A promoter asked the Joyful Trio to open for The LaFevres, one of Southern Gospel’s “first families” since 1921. Later, when Alphus Lafevre needed a soprano, he called Peck, who had just completed her sophomore year at Brenau. She began touring with the group when its founders were nearing retirement and passing the torch to Rex Nelon, who reconfigured The Lafevres as The Nelons. Peck toured and performed with The Nelons for about 10 years. “I was green as all get-out, wearing those fancy dresses and feeling like Cinderella, touring and traveling all over the place,” she says. The same could be said of her outsize stage presence. Peck, whose extracurricular music tastes include Lady Antebellum and Beyonce, comes across as a blond beatitude with a light heart and a killer wardrobe. She notes that ever since James D. Vaughan officially established Southern Gospel in 1910, its performers, like other sacred-music communities, have squabbled intramurally over issues of showmanship and solemnity. Over the past decade, the music surged in popularity through impresario Bill Gaither’s “homecoming” series of concert videos, which air ubiquitously on cable television. In 2004, the Gaither Homecoming concert tour ranked 16th in Pollstar, out-selling Elton John and Rod Stewart, among others, and Peck reigns as a Gaither favorite. A recent study ranked Southern Gospel was the ninth most popular format for AM stations and the 21st most popular for FM. When she married Rickey Gooch, the vocalist had planned to retire, more or less, and start a family. “I thought maybe I’d just perform locally from time to time, but God had other plans,” says Peck, who homeschools her two children. Peck’s husband, a hairstylist and builder, converted his family’s Lumpkin County homeplace in Yahoola (“Yay-hooler,” in the local dialect) into a gospel compound called New River Park, with a stage designed to look like a country chapel, covered in weathered, reclaimed wood with a tin roof. “There’s such a beautiful, quaint, serene feeling there, especially when the sun is setting, and you can see the cross outlined against the sky,” says Susan Jackson. For the past decade, the couple has held “Christian Music Nights,” an annual festival on Father’s Day weekend. It usually attracts a crowd of around 600, including gospel stalwarts such as the Lewis Family, The Primitive Quartet, old friends Jeff and Sheri Easter, and up-and-comers like CS&K and Brian Free and Assurance.